How, in a sports photo, can you selectively blur the background using FocalPoint so the person in the front pops more? The information in this post is coming from him, but I thought it was useful and helpful enough to write up. This is not the image he helped me with, this is another image I decided to try the technique on. Last year, through Mike's Camera, I got a chance to shoot the Denver Broncos practice (more information on that is here). This photo always looked kind of flat to me, and using Photoshop and FocalPoint, I was able to pop it a bit more. I just want to blur out everything besides Tebow a little bit more. Apparently FocalPoint has the benefit of just affecting a selection that you make in Photoshop. 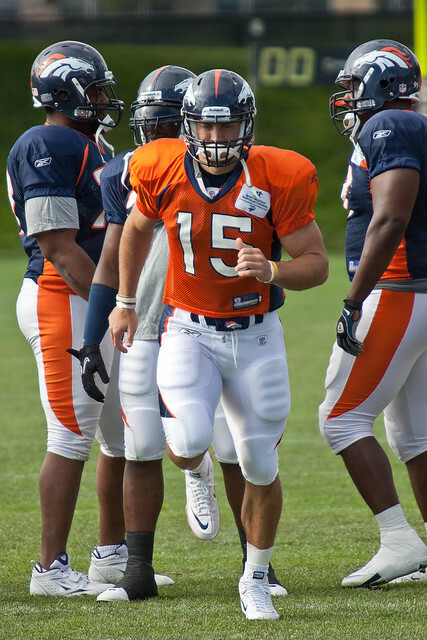 So, taking this photo into Photoshop, I can use the Quick Selection tool to do a pretty decent selection of Tebow. The selection can be refined as much as you want it to, but I think this is pretty good. One thing I need to do before bringing this into Focalpoint is to inverse the selection, because Focalpoint works on everything selected (and keeps in focus everything not selected). Going to Select->Inverse will do this for me. The grass is still in focus, because that's within the plane of the FocusBug. There are a couple of options I have to get that blurred. 1) I can use a mask and paint in blur just in those areas. The problem with that is making sure it looks natural, and that I don't accidentally paint on Tebow. 2) I could change the width of the FocusBug to 0. This not only still keeps Tebow completely in focus, but everything else will be out of focus. As that is the easier option, that's the one I'm going to do.